I’ve been getting some good feedback from my readers about the set as well as various interactions between certain cards, and I’ve also received some suggestions about my rating system. As I stated before, I wasn’t sure my evaluating skills had reached a point to become more accurate to the point that I could use a number based system. However, it seems like a few of your would actually prefer it to the three rankings I currently use for my picks. Well, starting with Origins this summer I will be changing the way I evaluate cards by using a 5 star system. It will be similar to what I do now, but I’ll use 1 star for a low pick, 2 for a Low/Medium, 3 for a Medium pick, 4 for a Medium/High pick, and 5 stars for a high pick. In the mean time, I’d like you to bear with me as I test it out along with my previous system. Today we’ll be covering green, the home of big beaters and the Mythical (rare) Tarmogoyf. 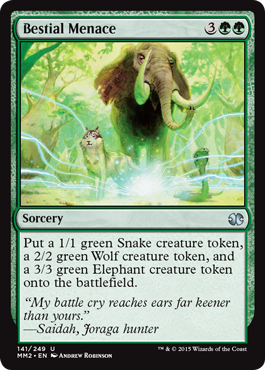 We all know that green is home to the biggest creatures in any set, and that means we need the mana to play them. 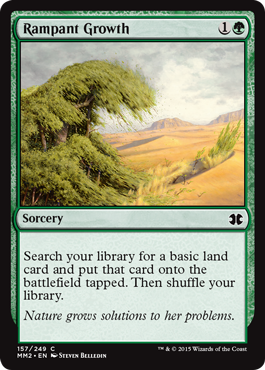 I usually don’t care for cards that search for land in standard sets because 1) the cards aren’t that powerful usually and 2) the tutor cards themselves are over costed and not worth playing most of the time. Rampant Growth has always been a solid ramp effect, and if you’re playing cards like Eldrazi you’ll definitely want to ramp into them as soon as possible. 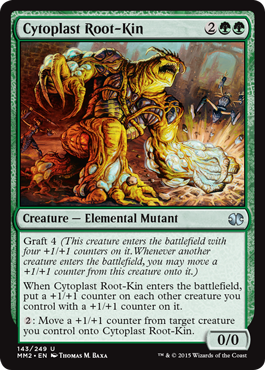 Rampant Growth is a role player in any deck playing green, and worth an inclusion in your 40 card deck unless you’re running an aggro deck. Speaking of ramping into bigger creatures, Nest Invader knows what’s going on. For 2 mana you get two creatures: a “bear” and a mana ramp guy. You could easily play a powerful 4 drop card like Creakwood Liege the following turn and start to take over the game. The tokens created also work really well with Scion of the Wild and Overwhelm if you have them or can draft them. I won many a game simply by ‘overwhelming’ my opponent a number of times during the release weekend in a booster draft. Another solid card that I think would fit in any green deck. Really good in a GBW token/sacrifice build. Not a first pick, but I think he’ll be highly sought after in draft. Our last ramp effect in green is Kozilek’s Predator. 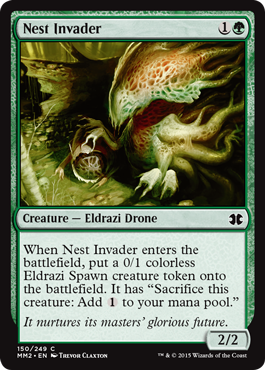 You could possibly sacrifice that eldrazi spawn from a Nest Invader to play him on turn 3 for a net of 1 more 0/1 ramp creature, but I’d prefer to hold off using these tokens until the most opportune time. The predator is probably THE BEST Eldrazi drone in the set and I expect him to be pretty popular. You get a 3/3 body, 2 bonus creatures, and on turn 5 you could potentially cheat a 7 or 8 drop into play such as Ulamog’s Crusher. If you draft any of the drones, get this one. GB sac/token all star. We have all this ramp, but what for? Well, Pelakka Wurm is a prime argument for playing ramp in your deck. Pelakka Wurm is the best non-rare finisher in the set: 7 power, 7 toughnes, 7 life, and you draw a card if he dies. He must be answered with removal if he hits the battlefield because there is little that can deal with him. You opponent will have to throw 3 bodies in front of him just to slow him down, and if you have removal for their creatures it’s game over. Its only draw back is the triple green casting cost. If you want to be able to cast him easily, you’ll need to be playing a 2 color deck with green as your main color, but it would be possible to splash a 3rd color in there if you wanted to. I like GB Ramp/Sacrifice as his home, but UG Graft with a splash of black for removal might not be bad either. I might possibly take this card as a first pick if my rare isn’t too exciting, though I’d be careful not to build around it if the cards weren’t there. Green might be lacking any good removal effects, but damn do the green cards in MM2 have a lot of value. Bestial Menace puts 6 power on the battlefield for 5 mana and gives you three bodies. 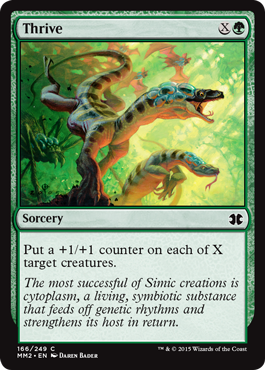 This is great for using Convoke, sacrificing to various effects, or to activate Graft effects multiple times. It fits great in GBW Tokens, but you could play it in any Green/x deck with green as the main color and it would be good. High pick in draft, but not a first pick. Speaking of Graft effects, the best one in the set is on the Cytoplast Root-Kin. He’s a creature but can also be a pseudo-anthem effect in a BUG Graft/Proliferate deck. I would absolutely love to play him alongside cards like Thrive and an army of tokens from Eldrazi Drones and other spells. Look for Proliferate cards such as Spread the Sickness, Tezzeret’s Gambit, and Thrummingbird to really take advantage of this cards ability. He’s solid in non-blue/black decks, but he’s a VERY high pick if you have multiple ways to take advantage of those +1/+1 counters. As I stated above, Thrive works best in a deck that has multiple Proliferate effects as well as Graft. I also would consider it a good card to have in GBW tokens even without proliferate. It’s not an overrun effect, but it’s close enough considering it’s a common. Not a high pick, but if you see either a Graft or Proliferate theme developing in your deck you should consider taking it. 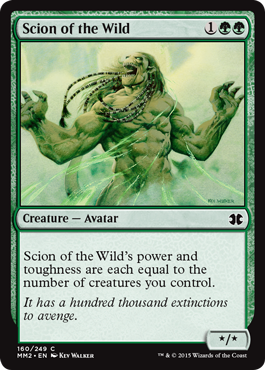 Scion of the Wild is a card I got a lot of practice with during the release weekend when I drafted 3 of them in a GB Eldrazi/Token/Ramp deck. Green was wide open and I stomped over people with him all day long. You’ll have to watch out for effects like Shrivel that could clear away your token creatures, but alongside Eldrazi spawn, Saprolings, and even Thrull tokens from Endrek Sahr (I drafted him alongside 3 Eldrazi – hilarity ensued) he will easily become your beater. Good card to draft after your first few picks. A MUST play in GB tokens. 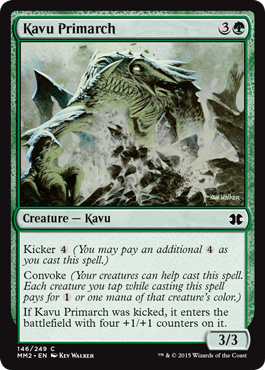 If you’re playing with GB or GBW tokens, Kavu Primarch has great synergy with them. Playing with spirit tokens and Eldrazi spawn will make it fairly easy to play him with the kicker cost so he can come into the battlefield as a 7/7 beater. That’s not the only reason you should play him though. You should definitely consider having the card in BUG Graft/Proliferate deck deck so he can get any bigger or get take advantage of cards that hunger for +1/+1 counters such as Novijen Sages or get bonuses such as flying from Helium Squirter. Sometimes synergy is better than value, depending on your pool. I had 2 in my pool the other day but ended up cutting them cause I felt Scion of the Wild was better due to the number of tokens I could make and the lower casting cost. It’s not a bad card in limited though, and it can be somewhat easy to cast thanks to the Convoke ability. Speaking of Convoke abilities, Overwhelm can be downright disgusting in a GBW white token deck. Thanks to Eldrazi drones and Endrek Sahr in my draft pool during release weekend, I was able to take full advantage of this card and when I drew it, it usually spelled game over for my opponent. It loses its value outside of a token themed deck though, so don’t force it in a deck that doesn’t allow you to cast it rather quickly. I’d also consider the card if my green cards were solid and the color was becoming my main one. I wouldn’t take it early in pack one, but I’d consider is as one of my first cards in packs 2 or 3 if the synergy was there. Vines of Vastwood was another card that I undervalued in limited at first, but as I played more games I found it to be downright amazing. 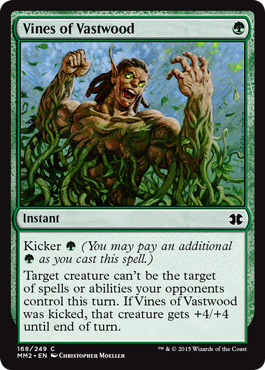 We all know how important removal is in any limited format, and Vines of Vastwood will do a great job of protecting your finisher/beater when your opponent tries to take it out. It also allows you to go on offense, pumping your creature and pushing through a larger chunk of damage or trading with a blocker/attack favorably. However, where I see this card really getting people is stopping your opponent from targeting their own creature with a spell or ability. It could stop something as common as a Apostle’s Blessing to make sure their creature dies, or it can stop a creature with counters on it from getting a Graft Bonus such as flying. It can also stop a creature from being enchanted by Splinter Twin or copied by Kiki-Jiki. I was using this during my practice booster draft and had the chance to stop my opponent from targeting his own creature to win the game. Very versatile card, and if you can’t get good removal for yourself in green, at least you can be prepared for it and any combat tricks your opponent my use. I’d high recommend playing one or two if you have multiple win conditions you want to protect. Aquastrand Spider – very solid 2 drop, and his ability is very relevant in a GBR/BUG Proliferate/Graft deck. No need to worry about playing sub-par flyers if you have him and a way to make lots of counters! Karplusan Strider – Another playable card, especially if your opponent is playing blue and black, but I feel like there are much better 4 drops I’d rather be playing. It’s not bad, it’s just that there are better choices out there and he’d be one of the first I’d cut. 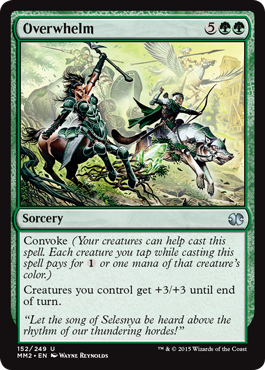 Scatter the Seeds – 3 creatures for 1 card is good, especially if you’re going for the token theme, and convoke helps too, but it’s only 3 total power you’re getting. Sundering Vitae – artifact removal is VERY important in this limited format with UW Affinity/Metalcraft and RW Voltron taking advantage of various artifacts such as Spellskite and Living Weapons. Must in your sideboard, and I’ve even considered artifact hate in the main board due to who commonplace it is. Convoke is also good. Green is an all around strong color in this format. It gives you ramp to get an Eldrazi or a Karn out quickly, it has lots of big beaters to take over a game with, endless armies of tokens, and it also has some pretty strong abilities on their creatures (such as the ones above). If you can draft good black removal early, I strongly recommend moving into green to get your hands on powerful creatures. I expect BG to be a popular archetype, as well as Junk Tokens, Jund Proliferate, and BUG proliferate. I’ll be heading out for GP Chiba in less than 4 days, so it’s definitely coming down to the wire now! Next time I plan on talking about Multicolor and Land cards, and given my limited schedule I’ll be trying to get it out either Tuesday night or Wednesday afternoon. As usual, I’d like you to give me any suggestions or feedback you have on today’s article, and I’d also like to hear what you think of the 5 Star rating system. Would you like to see more halves such as 3.5 stars, or is it fine the way it is now? Let me know what you think. Thanks for reading and join me again in a few days!